Ummm…. cute? 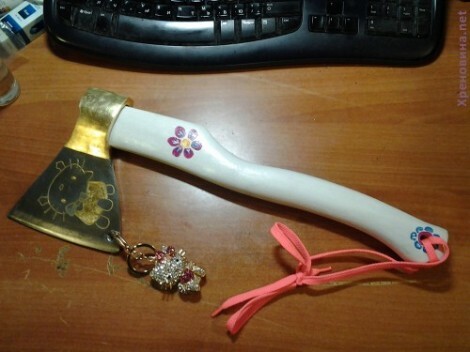 For the Hello Kitty fan who has everything? Yeah, we’re really not sure what’s going on here. It’s an art piece on which [Denis] spent a lot of time. He polished it, etched it, painted it, applied gold leaf, and drilled a hole for a charm. It’s that hole which interested us the most. He had a heck of a time figuring out how to make a hole in the hardened steel. The solution that finally worked was to use electrolysis to bore through the metal (translated). [Denis] first made a small depression where he wanted the hole. This took time, and pretty much ate through the engraver bit he was using. But it was just enough to hold a drop of saline. He connected the positive side of his power supply to the ax head, then dipped the negative lead into the drop of saline. Each time the drop turned black he wiped it away and replaced it with fresh solution. Just five hours of this and a pack or two of cotton swabs and he was through. more precisely, drillbit, low RPM, high force, lots of cutting oil. Plasma cutter would cut through it. The edge would have been pretty bad. Industrial laser (1000+ watts) would do a good job as would a waterjet or even an EDM, which is sort of what he is using actually. Die grinder would do it quicker. Yeah. Getting through hardened material isn’t easy. Knowing in hindsight how long it took means it is plain to see that the standard advice holds true. Five hours would have been enough time to build a small forge like can be found all over this site. This would be perfect for a bad horror movie with a young woman going around killing people. or 2 minutes with a carbide drill bit and a drill press. just because you can … doesnt always mean you should. I remember doing something like this. I replaced the broken blade of a butterfly knife with a file that I ground down to the proper shape. Since the file was harder than any drill bit I had available, I used a spark gap transformer and a mineral oil bath to punch holes for the hinge pins. Instead drilling / engraving a hole he could try to create a ring of say wax on the metal into which he puts his saline. Here is a nice Engineering primer on Electro Chemical Machining. Naw, I’m a huge Hello Kitty fan (seriously), but this just don’t do it. I wish he had found some professional line-art. Kind of looks like the head is upside-down! EDM is different from ECM. No sparks should be happening with ECM, it’s electroplating in reverse. EDM needs a dielectric fluid, Kerosene or de-ionized water and a deionizer tank to take up any generated ions. ECM needs a electrolytic fluid, Saltwater. EDM uses a pulsed square wave, high Volts low amps. It’s a thermal process that erodes the material, both anode and electrode get eroded. ECM uses direct current, low Volts high Amps. It’s a chemical ionising process, no thermal stresses, only the electrode gets eroded. Surface finishes down to Nanometer scale are possible. Neither should arc, though. It’ll instantly break the wire in WEDM, pit or destroy the electrode in the other types of machines. Hobbyists have made EDM and Wire EDM machines. allinhindsight nailed it for me…. anneal, drill, and since it’s decorative he wouldn’t need to retemper. I’ll give him points for finding a way to do it without a drill, but for my time I would have heated it to cherry red for awhile with a propane torch, then slowly brought it to room temperature. That may well have been enough to get through with one drill bit. Just goes to show that there’s more than one way to skin (or drill) a cat! One of the best ways I have found is t use a concrete drill bit and sharpen the tip. Use a slow speed and apply a constant force. You should hear and feel the drill bite and when you do start pressing a little harder. You can peck drill it as well if you are having issues with heat and swarf. Concrete drills have tungsten tips and are cheap. Flowing Salt water electrolyte would increase the material removal rate. Once the Chlorine in the NaCl in solution is depleted by converting Fe to FeCl2 (IronIIChloride) (Soluble @ 68.5 g/100mL (20 °C)) only the other side of the reaction is running, namely oxidation of the Iron to Plain old rust (Iron Oxide) or if Oxygen starved, Iron Hydroxide (Fe(OH)2) relatively insoluble which will drop out of solution out as a greenish precipitate. Of course you could do this with other metals, The reactions would be different. NaNO3 could be used as the salt as well. The original text is a hell of a fun to read. If you are a native speaker. I second the use of a plasma cutter. A Procut 80 would punch through even the thickest hardened axe blade in a couple seconds. You’d need a round file to clean up the hole and make it true round, but easy. This is a very cool method he came up with, however, and would work well on weird hardened steels if strange shapes were needed, as you could use the wax ring method to shape your “hole”. Of course, carbide drill bits and lots of tap magic cutting fluid work too. Props though for sitting there for 5 hrs to prove this way works! I can appreciate the commitment, but it just doesn’t do it for me, Hello Kitty gear should work at medium range at least. Is this the new Gulag punishment?! Use a belt sander or cheap disc sander in an electric drill to polish the axe, using successively finer grades. Drill using a cheap electric drill with a good quality drill bit! VERY SIMPLE. Couple of easy hours max. It would have saved about 2 days of hard labour. And who are these people with their plasma cutters and blasting holes with an arc welder? Hackers as basic as they come? Those with access to a plasma cutter perhaps not so much, those making do with an arc welder definitely. Not elegant or or petty but gets you where you want to go. I don’t have a plasma cutter. I’m a professional watchmaker and former machinist, very young, and was trained in stick, MIG, and TIG welding for a week, where I got to play with a huge amperage plasma cutter, a Procut 80. Any decent weld shop has a plasma cutter. Normal people don’t use them for anything or have one. People who do a lot of custom fab work on vehicles, scrappers, and welders have them. That’s where you get access to one! That said, there is no tool on earth that will put the fear and awe of god into you quicker than a large amp plasma cutter. They run a couple grand to buy, but DAMN are they fun to use! Imagine being able to cut nearly any metal item in half, or carve it like butter, and that’s what it’s like. Everyone should get to try it at least once. The chances that a cheap hatchet blade is hardened to any appreciable degree are remote. A hand drill with a HSS bit would probably have gone through it. Even good quality axes are relatively soft, it makes them tough, fracture resistant and easier to sharpen. If that’s some old soviet leftovers – it’s possible that’s it is REALLY hardened. So my bet is, that it’s indeed some old soviet leftover. Anyway, you’ll never know until you try. A fantastic art piece. I love it. Would even buy one. The drilling is kind of strange though. Why not spend a carbide drill bit on it? Or make a spark welder and use it in cutting mode? Again, this is not about the most efficient way of doing it. It’s about the process he used which is a bite unorthodoxed (which in turn makes it a hack), if you people think this is wrong or whatnot then you are not getting why it is being posted here. sheesh. his must have been one of the old soviet hatchets another poster was talking about.